Y&T are one of the most under-appreciated bands of all time and it doesn’t surprise me that Tim doesn’t care for them. He’s a bit nit-picky when it comes to rock n’ roll. He likes it clean and processed with very little of the spirit from the moment during conception. That’s just the way he is. I accept it and yet it makes me shake my head every time. I had trouble deciding on the which Y&T album to chose for this list. ‘In Rock We Trust’ is a good one. I love the live ‘Open Fire’ release. And ‘Mean Streak’ is a great album. The band lost me when they were seeing some commercial success with the song “Summertime Girls” which was tacked on to the ‘Open Fire’ album. They double-dipped and put it on ‘Down for the Count’ that was released later that same year. ‘Down for the Count’ was not well received by me. And then they moved over to Geffen Records for the atrocious ‘Contagious’ album. I don’t know the full story, but at the time when that album was released there were rumors that Y&T parted ways with drummer Leonard Haze because of his lack of rock star looks needed for MTV. True or not, that put a bad taste in my mouth and I moved away from Y&T. I have never seen Y&T live before, but I did see a concert that was aired on MTV. Dave Meniketti is not only an amazing, under-rated lead guitarist, but he’s also a great front man. Granted, as Tim pointed out, he doesn’t possess the greatest of voices. But he emotes with his heart and you feel like the guy is singing his guts out. Meniketti plays mostly Les Pauls and utilizes the toggle switch during his lead solos when the song calls for it. For some reason, it flips me out. No pun intended. “From the Moon” pulls you right up to “Open Fire” which is one of those cheerleading songs where they tell you that they’re going to rock and how they’re going to rock you. Normally, I steer clear of those but there’s just something about that song. It cannot be denied. “Don’t Wanna Lose” and “Hell and High Water” backs down on the punchy hard rock. But “Forever” slides in and before you know it, you’re face has been rocked off. The title track opens up side 2. I only say that because I grew up with the vinyl album that I still have. For years you could only get it on CD as an expensive Japanese import. As much as I dug the album, I just couldn’t justify a repurchase of the album at such a higher rate. I held out and now I can stream it on Spotify all I want and just about everywhere I go. But I digress… The title track is a rocker. Then “Barroom Boogie” comes up with a bit of humor. It’s a fun little ditty and I’m surprised that Beeman didn’t even write about it. “My Way or the Highway” and “Winds of Change” close out the album. 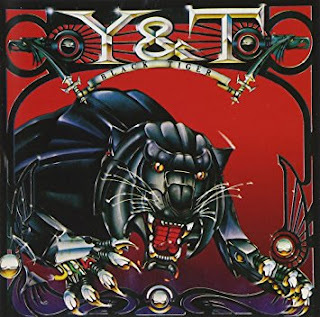 Y&T were one of those bands from the San Francisco Bay area that never made it big. The former members ran into all kinds of issues and bad situations that life can hand out. And there’s a funny story involving Rock the robot from the ‘In Rock We Trust’ album. Rock was made by A&M Records for $17,000. When they fired Joey Alves he took the robot that used to grace the stages around the world. He gave it to a friend who died and his wife took Rock. It’s been spray painted and worn for costume parties and taking first prize. So it’s still out there, but the Meniketti still hasn’t seen it. I suggest giving this album a spin along with ‘Mean Streak’ and ‘Open Fire’. Hopefully, you too will find an appreciation for them. Here is Tim's take on the album. I do hope Jon hasn't abandoned the project, but hey... The guy has been jet-setting all over the place lately. So maybe he's listening and making notes. And I'm trying to get caught up with Beeman who is the only one keeping to the schedule.